Can Road Salt Damage Your Car? Why do they use salt on roads? In addition to being an easy way to bring out flavor while cooking – salt serves as a valuable mineral for those who have to drive during icy conditions up north. Salt lowers the freezing point of water, causing it to melt even when the air temperature is below 32 degrees. 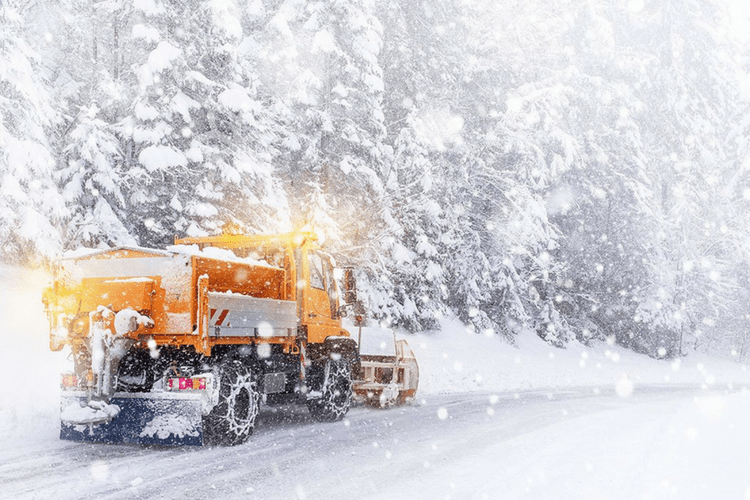 Most cities deploy trucks filled with a salt and sand mixture ahead of, and during, major winter storms to keep the roads as safe as possible. This is great for traction, but not so great for your car. How bad is salt for my car? Salt is corrosive and accelerates the process of rust formation on metal surfaces. You won’t typically have to worry about your cars paint thanks to advances in surface technology – though it’s still a good idea to wash your car after a winter storm. The real danger is rust on the undercarriage where important system components are housed. Your brakes, transmission, and other vital pieces are all exposed as you drive through the snow and ice. Long-term exposure means risking not only your car’s looks but its overall safety. Getting prepared for the winter is easy – just wash and wax your car before the winter months hit. A good wax coating will last 6-8 weeks, or you can choose a synthetic paint sealant which will last until summer. If you want to go the extra mile, consider an undercoating treatment from a collision or body shop in your area. These are not prohibitively expensive and make it difficult for salt to cling to your car. Once winter hits, be sure to wash your car after a winter storm. Wiping down the surface will keep your car looking great and ensure that road salt doesn’t corrode the surface. Keeping salt off your paint is largely cosmetic, however, so the real work is making sure that your car’s undercarriage is cleaned after exposure. A drive-through car wash will work for this but can leave swirl marks on the surface of your paint. Your best bet is a hand wash that offers an undercarriage spray. Preventing salt damage and keeping your car looking great during the winter months is a simple matter of a little prevention and the occasional wash in season. The car washes that I go to use soft Chamois strips instead of those old plastic bristles that they used to use that did cause the striping down the side and on the top surfaces. The important thing in the winter is to use a car wash that does the bottom blast to get the salt out from underneath the car. After a snow storm, wash your car? When it’s -21 degrees? Sure. Cheap, rural towns don’t use salt when temps are even -3 degrees. They say salt won’t work at low temperatures. Maybe if drivers start bringing suits against these “don’t give a s**t” towns, and winning, these yocals might possibly start to understand that salting their roads might actually be cheaper than paying out thousands of dollars to accident victims. Might. And hand wash in the winter? Fine. Stop by and hand wash my car today at -19. What a country, huh?